Pie! 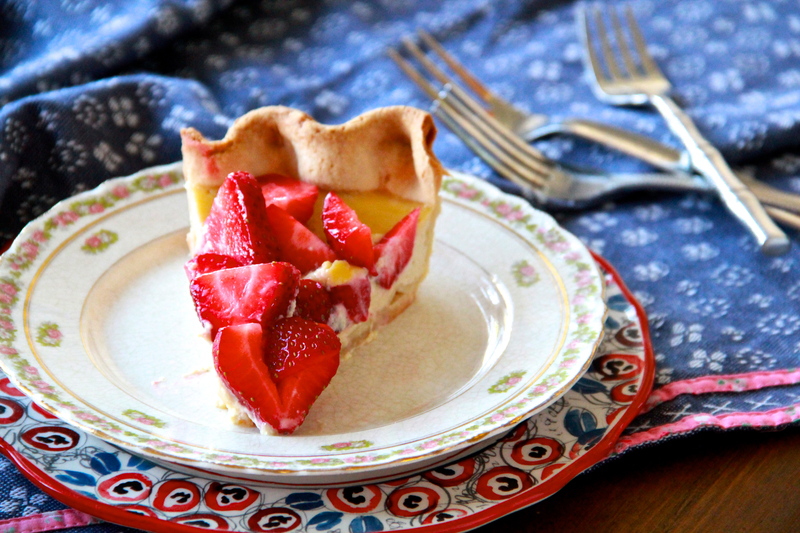 A light and creamy one, covered with bright and juicy strawberries. So. Yeah. That’s all, really. Need I say much more? I think it’s safe to say that this has been a rough week, and a little big slice of pie feels like a welcome thing this weekend. This one’s got a sugar-and-egg-enriched crust and a sour-cream-and-yogurt-based custard filling. It’s smooth and velvety and just faintly sweet with brown sugar. And the ruby tumble of berries on top? Essential. Pile those on there. It took me a few happy bites slices of this beauty before I realized that the whole thing is actually pretty reminiscent of cheesecake, which makes a lot of sense if you look at the ingredient list (eggs, sugar, sour cream… oh hello, extensive pastry training). A welcome discovery! 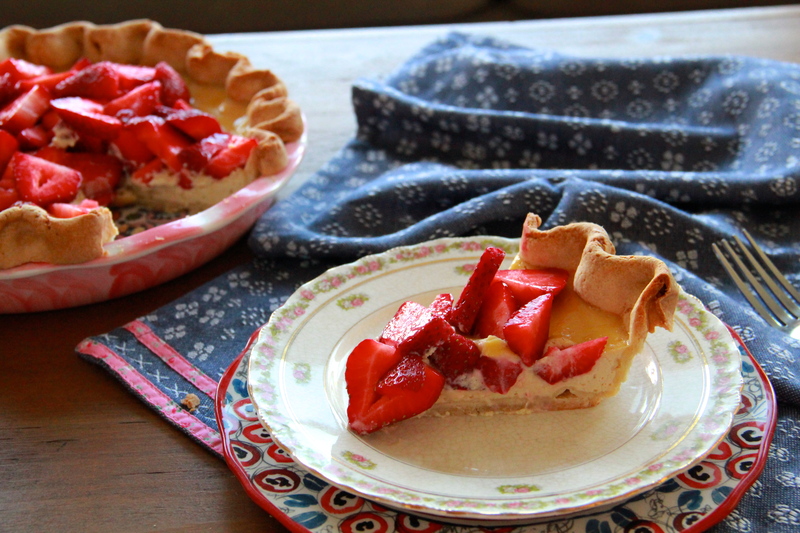 Strawberry cheesecake pie? Alright then. The inspiration for this pie came from a beautiful Labneh Tart recently featured by Alice Medrich on Food52. When I set out to bake I didn’t have the time or patience to make my own Labneh, but I had a carton of sour cream and big dreams to pie-ify the classic strawberry/sour cream/brown sugar combination. I lightened things up a bit by using some Greek yogurt alongside the sour cream, and the pie turned out gorgeously creamy but only faintly sweet. I’m a big fan of the recipe as-is, but if you want more sweetness and brown sugar flavor, I’d try doubling the sugar in the filling, to 1/2 cup. To make the pie dough, whisk together the flour, sugar and salt in a bowl. Mix the cold, cubed butter into the dry ingredients using two forks or clean fingertips, until the butter is incorporated and the mixture has a sandy texture. Form a well in the butter-flour mixture and pour the egg/water mixture in the well. Begin to combine the liquid into the flour-butter mixture with a fork or wooden spoon, being careful not to overwork the dough. If the dough seems too dry (if it’s too flaky and won’t stick together), add a few drops of ice-water (a tablespoon at a time) until it comes together. Gather the dough, form it into a flat disc, and wrap it in plastic wrap. Chill in the refrigerator at least 30 minutes. Heat the oven to 350 degrees F. Once chilled, roll out the dough into a large circle, about 1/4- to 1/8 inch thick, then transfer it to a 9″ pie dish. Use your fingertips or a fork to crimp the edges decoratively. Gently prick the bottom of the crust a few times with a fork. Set the dish on a baking sheet, and bake the unfilled pie shell until golden brown and dry on the bottom, 20-25 minutes. Remove shell from the oven and lower heat to 300 degrees F.
While the shell bakes, mix up the filling. Whisk together the eggs, sugar, salt, and vanilla, then whisk in the sour cream and yogurt until smooth. Pour the filling into the warm pie shell and return the pie to the lowered oven for about 30 minutes, or until the custard is set around the edges but still jiggles a bit in the center. 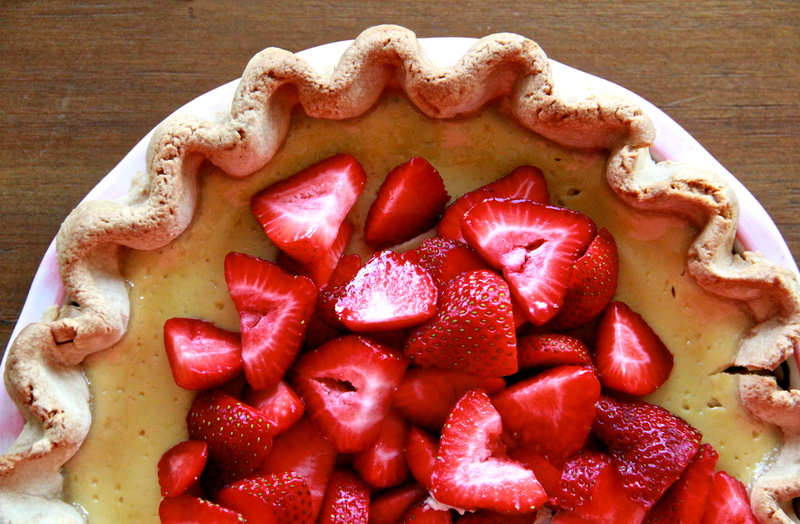 Allow the pie to cool completely before arranging the fresh strawberries on top. 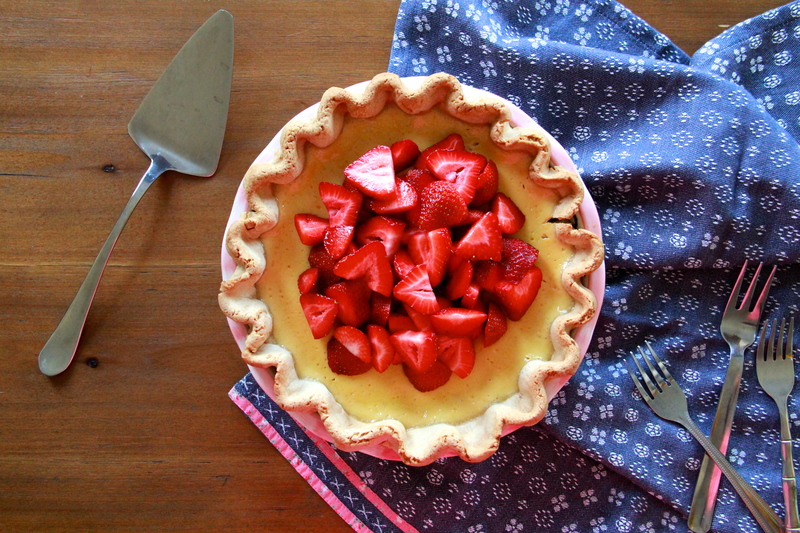 Serve immediately or chill in the refrigerator until ready to serve – pie will last about 3 days in the refrigerator. Note: if not planning to serve right away, chill the naked pie on its own; top with berries just before serving. This looks simply delightful. Strawberry desserts are my favorite. What other summer fruits would work on here? Cherries! Peaches! Figs! Cherries! Anything ripe and sweet would be wonderful here. adding this to my “to make/by chef molly” file! Hi! I’m wondering if this pie is freezable/thawible (thawable?) or if that would ruin it because of the cream. I’m headed the “Strawberry Music Festival” this weekend and I’d love to make it ahead of time. I’m figuring the strawberries I’d keep separate until I serve it. Hey Johanna! I actually think you could freeze/thaw this, since it’s so similar to cheesecake (and people freeze those all the time), though since I haven’t tried it myself I’m not totally positive. 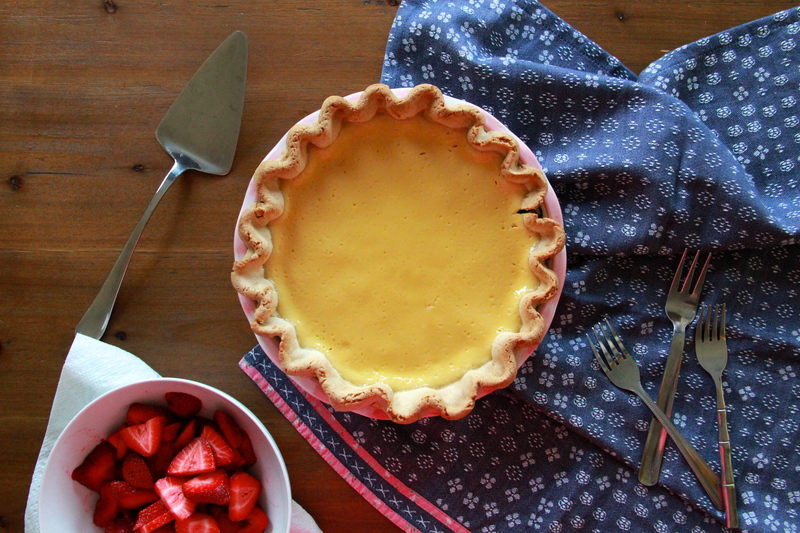 The pie will definitely hold up for a few days (about 3) in the fridge (without strawberries) if you have time to make it midweek… I hope it works out! Sounds like a great time. Guess what we made tonight? Naturally, I forgot to take pictures, but it was very tasty! Thanks for the recipe!